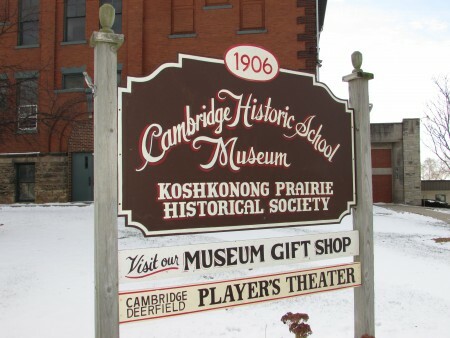 We became interested in Cambridge when we discovered what an important part of the recreation industry it is. 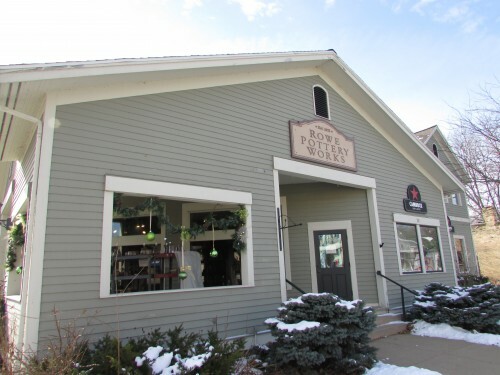 Also the art scene, pottery in particular. 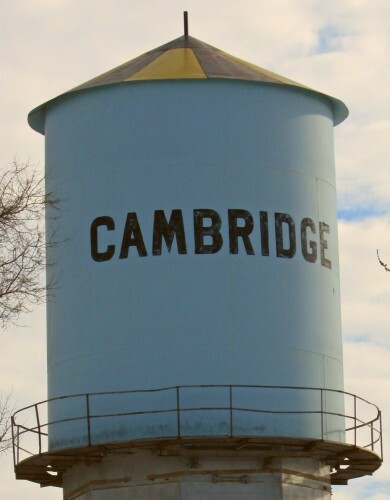 Cambridge has been dubbed the “Salt-glazed Pottery Capitol of the World” in the 1980-90’s. See here for all the artists creating great art for sale in Cambridge. 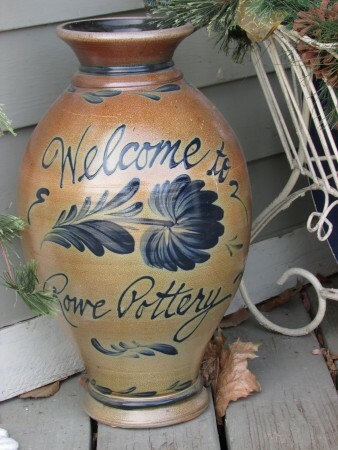 We visited Rowe Pottery Works and really enjoyed seeing their great pottery and attractive displays. 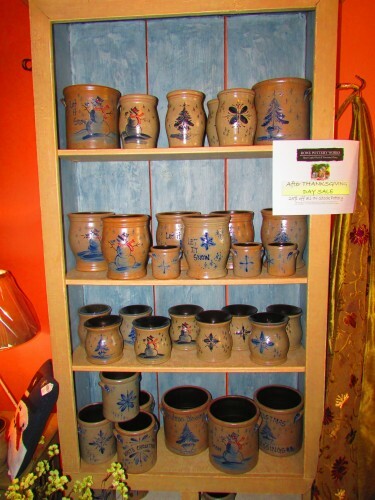 They even can customize pottery for you to make a great gift for that special someone! As for contributions to the recreation industry, Cambridge became a favorite place for Chicagoans to visit, especially in summer. This all began in the late 1800’s. 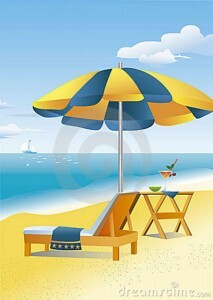 Cambridge soon saw their own Lake Ripley’s beach dotted with many blue and yellow beach umbrellas in summer. Cambridge turned this into an opportunity to encourage tourists to come visit. They called themselves “Umbrella City”, and added a yellow and blue beach umbrella to their logo. Some liken Cambridge to be like a little “Lake Geneva“, another lake in Wisconsin that boasts many Illinois visitors. The umbrella even tops of their historic water tower. 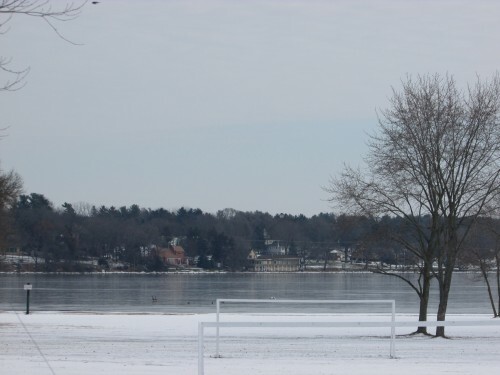 Here is a winter scene of Lake Ripley as seen from Ripley Park, and a historic marker discussing another famous past resident of Cambridge. 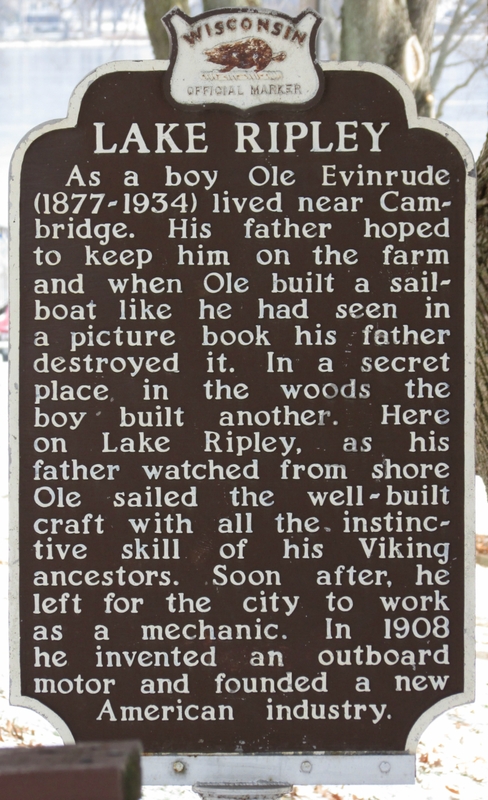 Ole Evinrude invented the outboard motor for boats, which no doubt are on many of the boats cruising Lake Ripley in the summer today. The other famous inventor that resided in Cambridge was Arthur Davidson, of Harley-Davidson motorcycle fame. See the Harley-Davidson Museum in Milwaukee to learn more. Matt Kenseth of NASCAR fame also hails from Cambridge. 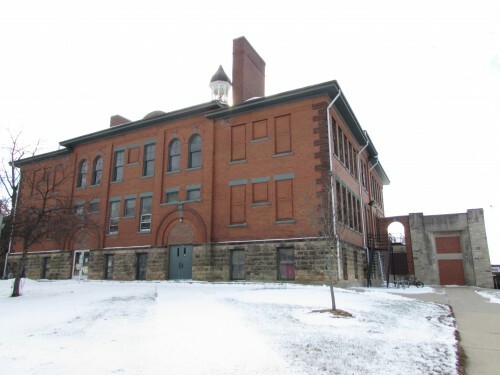 We saw other historic buildings, the former school of red brick, now the home of the town museum and civic theater group. 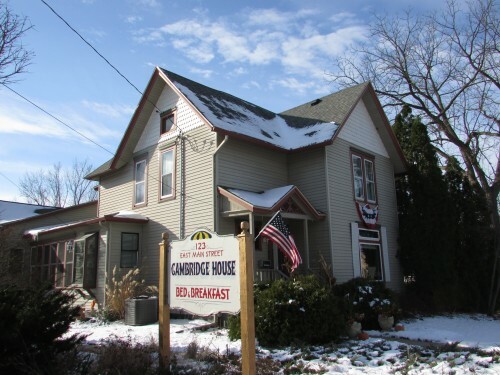 The Cambridge House Bed and Breakfast, formerly the home of Doctor Bilstad in town 100 years ago. 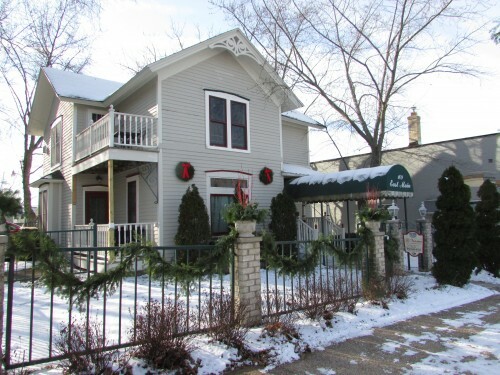 For a longer stay in Cambridge, you might enjoy The Victorian. 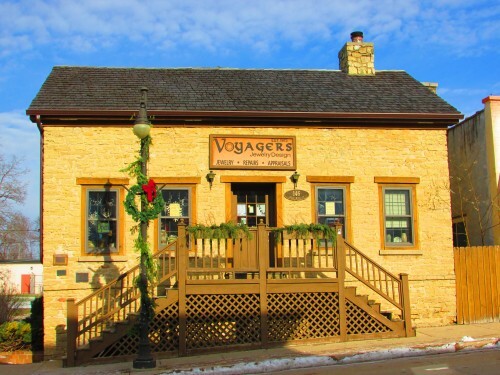 Also a beautiful Historic Old Stonehouse , built in 1851, owned by the Cambridge Foundation and for many years has been home to The Voyager’s Jewelery Design. 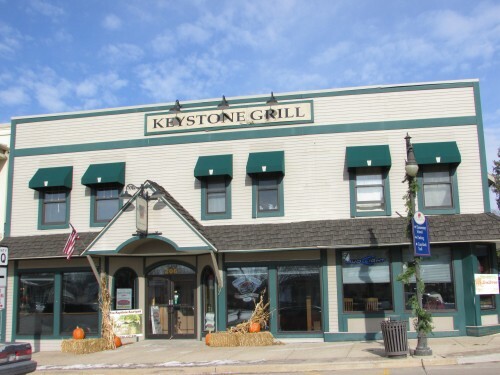 We enjoyed a great lunch at the Keystone Grill. Motor your way into Cambridge, you will enjoy your visit!